Did I miss HMRC Tax Deadline Day? 31st January! 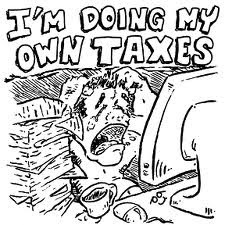 Unless you are very organised and very used to completing your own tax return, we at Bettertax, would hate to see you like this! Doesn’t look much like fun, does it? You should know a Tax Return must be filed with HM Revenue & Customs if you are registered for self-assessment. Your tax return allows both you and HMRC to ascertain how much tax you are due to receive or indeed pay. It can be difficult to know exactly what you need to pay and what you can claim. Do you even know if you are entitled to claim any tax back? Tax returns only need to completed if you have registered for self assessment. Most PAYE employees would not be registered as their tax and allowances are all accounted for by their employers and there should be no allowable expenses to be claimed for. However, there are many industries where PAYE tradesmen find themselves using there own vehicle to get to temporary workplaces and often buying their own tools and equipment to do their job. It was very apparent to us when helping our construction industry scheme (CIS) clients, that PAYE employess in particular would come under the category of filing a self-assessment tax return. In an earlier blog, Self Assessment is NOT Self Employment, we explained that PAYE workers can register for self assessment and therefore claim back any expenses incurred against their tax. If you are at all unsure about your eligibilty to claim tax back, give us a call and we can quickly tell you. If you are submitting a paper tax return to HMRC, it must reach them by midnight on the 31st of October. Should you miss this deadline, a return can be completed online. This must reach HMRC by midnight on the 31st of January. To avoid any potentially costly mistakes, we recommend asking a specialist to your industry tax adviser to complete your return for you. As tradesman’s tax refund experts, in our experience, the amount we can claim back for you is very often more than you would achieve yourself and justifies paying professionals to do the work. Afterall, I am no car expert, so I’d get a professional mechanic to fix my car – I could try doing it myself, of course! Late fees can be a common problem when filing returns. By submitting after midnight the 31st of January, you will face an instant £100 penalty. Filing any later than this will lead to larger, much more unwelcome fees. See our blog, Self assessment penalties at highest rate ever. If you find yourself in this situation, we can certainly help you deal with HMRC and get your tax sorted out as quickly as possible – don’t be an ostrich! Re-published from an original article in January 2013. Home » Blog » Did I miss HMRC Tax Deadline Day? 31st January!